This article has new content coming soon from Halo: Official Spartan Field Manual, and may not be complete, confirmed or correct. Please update it as soon as any relevant and accurate material is available. "They were outfitted with Mjolnir GEN2 armor, the next evolution of the armor Halsey had fashioned decades earlier." Warrior, the mainline version of the GEN2 suit. The MJOLNIR Powered Assault Armor [GEN2] is the second system-wide generation of the MJOLNIR Powered Assault Armor. GEN2 introduces many improvements to the suit's core architecture, specifically tailored for use by the Spartan-IV supersoldiers. The production of second generation Mjolnir armor uses a spiral-development model, allowing the United Nations Space Command and its various contracted, corporate partners to create and design armor systems much faster and more efficiently than before. "Spartan Thomas, you will get your armor when you show me you deserve to wear it." Spartan-IIs of Blue Team in GEN2 armor. The GEN2 Mjolnir armor was initially developed and created by the Office of Naval Intelligence's Materials Group as a response to the emerging SPARTAN-IV program, initiated on January 7, 2553. Several early models of the GEN2 Mjolnir armor were field tested by Spartan Tedra Grant. Some of the first contemporary models of the GEN2 Mjolnir armor were first tested in combat in January 2553 when New Colonial Alliance forces launched a raid on UNSC Infinity and the five Spartan-IVs in-training aboard the warship were forced to don the armor to help combat the insurgents. As of 2558, GEN2 armor is standard-issue for nearly all active Spartans, having replaced the Semi-Powered Infiltration armor of the Spartan-IIIs. The remaining active Spartan-IIs, such as those on Blue Team, have since donned GEN2 armor. Initially, Spartan-II Naomi-010 used MJOLNIR Mark VII Powered Assault Armor, the last iteration of the first generation of Mjolnir armor. However, Mark VII never saw full implementation with the rest of the Spartan-IIs due to its complexity and expense. Eventually, the UNSC determined that continuing to fund the first generation of Mjolnir armor—that was only focused on the Spartan-IIs—was not worth the costs, particularly given the escalating costs and capabilities of the newer Spartan-IIIs and Spartan-IVs in GEN2 armor. As a result, the Mark VII has largely been phased out of production in favor of the GEN2 Mjolnir, though many technologies developed for the Mark VII have since been incorporated into the GEN2 armor. While the previous iteration of the MJOLNIR Powered Assault Armor was often—though, not always—created and manufactured by organizations, departments, and branches of the United Nations Space Command, the Unified Earth Government has contracted numerous corporations to design GEN2 armor variants. For example, RKD Group was responsible for designing the MIRMILLION-class armor variant, though the group contracted Korolev Heavy Industries to produce the armor and licensed the suit's BIOS from Applied Heuristics. Even major military-industrial concerns, such as Beweglichkeitsrüstungsysteme, no longer control all aspects of their armors' tactical packages and software, both within the military and among private contractors. Production of some GEN1 variants was shifted between corporate entities, while other contracts were transferred from the military to private industries. In addition to these larger corporations, a major policy shift within the UEG has led to smaller corporations and businesses being given the opportunity to compete in the paramilitary, military, and security markets. Many smaller industrial design firms and military subcontractors have used the common GEN2 Mjolnir software and exoskeleton as a springboard for their own innovations. Nonetheless, UNSC organizations, such as Materials Group and the Watershed Division, still continue to manufacture several variants of the GEN2 Mjolnir armor. In addition to human corporations, select other species have had a role in the development of some iterations of GEN2 Mjolnir armor and its components. Notably, the HELIOSKRILL-class Mjolnir was designed by a Sangheili artisan-armorer designer who had managed to reverse-engineer the Mjolnir armor in an effort to test her skills against humanity's best armor manufacturers. This Mjolnir variant is designed by Sanghelios' Kolaar Manufactorum and fielded among the Spartan-IVs. 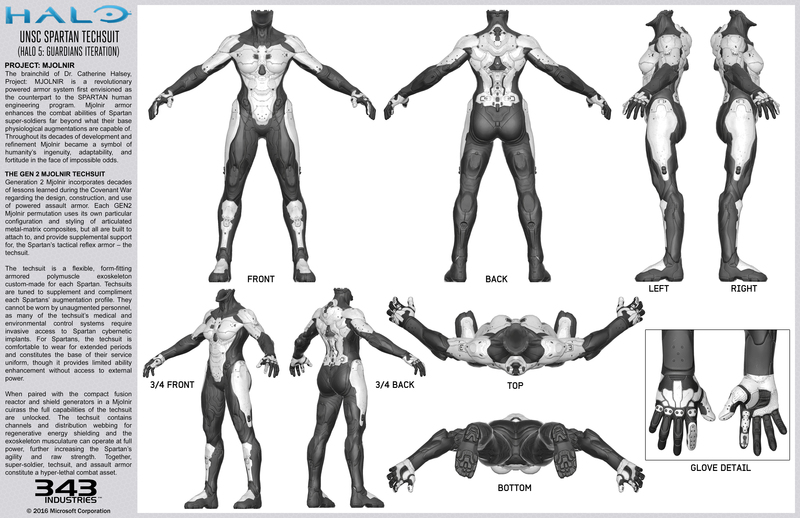 Some VISR designs have been created using high-tier nanolaminates and scanning elements provided by the Sangheili, while others are even compatible with the Sangheili combat harness. As ties between the Swords of Sanghelios and UEG strengthen, many Sangheili artisans have gained interests in working with GEN2 armor. The "King" VISR utilized by some Spartans was initially created by a bored Huragok and subsequent attempts to copy the design have been met with varying levels of failure. Even Forerunner technology has been incorporated into the armor. Additionally, VISR kits with an unknown manufacturer have been found by ONI operatives in the arms markets of the insurgent-controlled Venezia. Jameson Locke using his armor's thrusters. The armor was designed to compensate for the Spartan-IVs' less extensive physical augmentations in comparison to the previous two generations. As a result, the armor multiplies the strength of its wearer significantly more than the first-generation suits, granting the Spartan-IVs roughly equal strength as their predecessors while wearing the suit. The GEN2 suit is also lighter and stronger in construction than the first-generation Mjolnir line, weighing approximately a couple hundred kilograms. GEN2 Mjolnir integrates the vast majority of the armor's vital hardware systems within the inner techsuit itself, allowing for more streamlined production and easier implementation of specialized subsystems and armatures. The GEN2 armor incorporates new ad hoc modification systems which allow the armor to use armor abilities, tactical packages, and support upgrades. Like its GEN1 predecessors it is backwards compatible—through hardware and firmware upgrades—with previous armor systems, including the Mark IV, Mark V, Mark VI, and the MJOLNIR variant of the Orbital Drop Shock Troopers' armor. In addition, GEN2 armor features integration with artificial intelligences, ranging from volitional smart AIs to simpler, yet complex, dumb AIs. The AIs that manage the Mjolnir BIOS and VISR are generally passive helpers that integrate, prioritize, and even subtly alter the torrent of data and sensory overrides fed to the armor's Spartan user, simplifying the chaos of the battlefield and reducing confusion. These AIs also handle mundane administrative tasks by filing munition expenditure forms, battle damage assessments, kill reports, and other paperwork on behalf of the Spartan. The typical suit of Mjolnir armor carries around a dozen or so of these AIs, each specialized in numerous tasks of war and science to aid the Spartan they are attached to. While these AIs are incapable of a human's oversight, they are still a valuable component of the armor. The BROKKR Armor Mechanism is a Da Vinci multi-axis assembly system used to mount Mjolnir onto a Spartan's techsuit. "That armor was fantastic, but the colors on it never held up. It always came back from every mission scratched, scraped, and dinged to hell. And that was the way we liked it." Several variants of the GEN2 Mjolnir armor. Many Spartan-IVs choose to customize their armor in a variety of ways and are typically given the option to choose armor variant, paint color, visor model, and other cosmetic features. Even tech suits can be modified based on the Spartan's mission or need. An assortment of armor configurations are available for all new Spartan-IV recruits as per UNSC Regulation 3A-950, and Spartans are capable of customizing their individual armor set with modular components from a wide range of special-purpose variants, based on their personal preferences, specialization and mission requirements. Selecting variants for purely cosmetic reasons is discouraged. The UNSC strictly forbids Spartans from attempting to repair or modify their armor on their own; all armor maintenance is only to be performed by qualified Class-61 technicians in dedicated facilities. 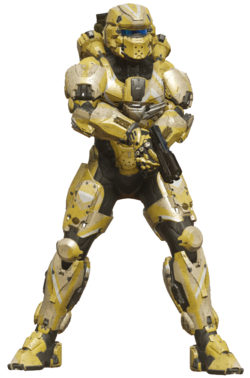 Unlike the generally green coloration of the Spartan-IIs' Mjolnir armor, Spartan-IV armor comes in a profusion of distinct color patterns, with the members of specific teams sometimes (though not always) sporting a consistent coloration. However, any customization of the armor color must be in accordance to UNSC Equipment Code 20.00.62. The paint used on each GEN2 Mjolnir armor set is known to quickly deteriorate in combat, as little effort was made to invest in stronger quality paint. While the suit's primary production model bears less significance than in the previous Mjolnir generations due to GEN2's more distributed design philosophy, the Materials Group's Warrior variant is officially considered the mainline model of the GEN2 armor. Another prevalent model is the Recruit variant, which is issued to all Spartan-IVs upon induction and colored gray and gold by default. GEN2 Mjolnir is also able to be hybridized with GEN1 Mjolnir suits. When Douglas-042's Mark IV armor was damaged and UNSC Spirit of Fire was unable to produce core components during Second Ark Conflict, the Spirit managed to upgrade the suit into a hybrid version of Mark IV/GEN2, along with the rest of Red Team's armor, thanks to amalgamation of modifications made by Isabel and Serina and recovery of GEN2 parts from UNSC outposts. The suit also possesses other upgraded features that enhance its wearer's abilities. It has an upgraded heads-up display linked to sensors that project shield strength and an improved motion detecting system in addition to providing other numerous readouts, including allies' vitality and shield status. These features are maintained and initialized by the MJOLNIR GEN2 BIOS firmware. Numerous versions exist for several different reasons and to simply being an upgrade. Mark VI GEN2 - A variant based on the GEN1 Mark VI, designed specifically for the [GEN2] suite. MP - A variant for Military Police, upgraded from GEN 1. There are several forearms and legs not paired with a specific set that can be used with most GEN2 armor. Contoured: This variant is manufactured by Lethbridge Industrial. The forearms were favored during the hostilities of the Thales Expedition. The legs were based on native Sangheili equipment. There is a SHARD skin for this set. GV-09 Locking: These forearms are manufactured by Acheron Security on the planet Mars. These improve comfort through modularity. There is a FOREST skin related to HAZOP armor. Inner-plated: This variant is manufactured by the Materials Group. These forearms gained popularity during the revolt on Terceira. There is a WEB skin related to CIO armor. LG-50 Bulk: This variant is manufactured by Imbrium Machine Complex. The legs were designed with intentional redundancy to decrease risk of breach. There is a PULSE skin related to GUNGIR armor. Outer-plated: The forearms of this variant are manufactured by Lethbridge Industrial. The forearms were originally conceived for engagement operators on Cascade. The legs of this variant are manufactured by the Materials Group. The whole system saw little activity until the Concord incident in 2554. The wrists have a RAPTOR skin related to Venator armor. The Legs have a CIRCUIT skin related to Oceanic armor. Over-locking: This variant is manufactured by the Imbrium Machine Complex. The legs have seen recent exposure with outworld security personnel. There is a WEB skin related to CIO armor. RG-63 Counter: This variant is manufactured by Imbrium Machine Complex. These forearms were developed based on intel from the Harvest campaign. There is a PRIME skin related to Recruit armor. There is a FOREST skin related to HAZOP armor. Twin-plated: This variant is manufactured by Naphtali Contractor Corporation. These forearms first saw use in 2556, but were prototyped during Mjolnir's GEN1 era. There is a AEON skin for this set. XG-89 Narrow: This variant is manufactured by the Materials Group. The narrow-slat legs excel at shield distribution while reducing ceramic profile. There is a RAPTOR skin related to Venator armor. XV-27 Shifting: This variant is manufactured by Naphtali Contractor Corporation. These forearms were tested in the Buffalo Breaker Yards. There is a CIRCUIT skin related to Oceanic armor. There is a PULSE skin related to GUNGNIR armor. The armor system is built to support a variety of attachments and equipment which allow it to utilize armor abilities. Some of them have been reverse-engineered from Covenant and Forerunner technology. Biofoam injectors: Allow for physical injuries to be sealed and repaired without the use of external medical kits. Energy shielding: A protective barrier that surrounds the armor and protects the user from harm. Compact fusion reactor: The fusion reactor is the most essential part of the MJOLNIR system, as it provides power to all equipment on the armor—the reactor is built into the suit and allows for nearly unlimited movement. [GEN2]'s fusion reactor is installed at the back of the torso carapace. Magnetic weapon holder strips: The MJOLNIR armor features very small, yet powerful magnets placed on the legs, waist, and back of the suit that are used to hold any equipment or any weapons with a magnetic property. The suit also contains a magnet system within its boots that allows its wearer to stay attached to a metal surface in zero gravity environments and can be toggled on or off by the wearer. MJOLNIR GEN2 BIOS: The basic input/output system, standard firmware interface of the GEN2 suite. VISR 4.0: Up to version 4.09, these visor installments are optimized and customized to facilitate specialized tasks. VISR 4.0 is capable of managing a Spartan's disparate sensor feeds, battlenet links, and suit diagnostic messages. Force-multiplying circuits: Allows the user greatly enhanced reflexes and strength, improving mobility and combat effectiveness in close quarters. Notwithstanding the lack of any truly understood limitations, Spartans have been recorded lifting Warthogs, bending steel, and shattering concrete on the battlefield. Motion tracker: Shows movement of friendly and enemy units within the system's radius. Support upgrades: These customized and specialized upgrades allow combat advantages by modifying the core and periphery systems of GEN2. Sprint module: Unlike previous armor systems, Mjolnir GEN2 has a built-in sprint module that allows the user to run at faster speeds by overriding safety protocols. It is functionally similar to the version developed by Kat-B320 of NOBLE Team, which saw widespread deployment across Reach in the planet's final days. Tactical packages: These customized and specialized packages allow combat advantages by modifying the core and periphery systems of GEN2. Titanium nanocomposite bodysuit: Sandwiched between the external armor and the internal padding is a thick armored bodysuit. The bodysuit is made of a nonrigid titanium-based material, making it very strong and yet very flexible. The suit has numerous functions, small but vital to the safety and survival of the wearer. It also serves as another layer of protection against ballistics attacks and is coated with a heat-resistant material to disperse heat from plasma weapons. Many components of the GEN2's titanium bodysuit are conspicuously fashioned after the shape of human musculature; this was less prominent in previous Mjolnir generations. In fact, each techsuit is custom-made for the Spartan that wears it. Some models have portions of the bodysuit share their color with the external armor plating, though completely black bodysuits are still common. Certain fireteams or individual operatives are outfitted with customized techsuits that contain a host of undisclosed improvements or modifications to fit particular mission parameters or operator need.These polymuscle exoskeletons cannot be worn by unaugmented personnel, as many of the techsuit's medical and environmental control systems require invasive access to Spartan cybernetic implants. The techsuit is comfortable to wear for extended periods of time and constitutes the base of Spartans' service uniform, though it provides limited ability enhancement without access to external power. When paired with the compact fusion reactor and shield generators in a Mjolnir cuirass the full capabilities of the techsuit are unlocked. It contains channels and distribution webbing for regenerative energy shielding and the exoskeleton musculature can operate at full power, further increasing the wearer's agility and raw strength. Integrated thruster system: GEN2 suits are equipped with an array of shoulder- and back-mounted thrusters, increasing a Spartan's mobility in the field and presumably in vacuum environments. The system, which was added as part of a series-wide update, partly alleviates the need to use an external thruster unit or jetpack; however, it provides only limited thrust and as such does not fully replace external thrust apparatuses. It is still powerful enough to allow the user to hover a few seconds in mid-air when activated in a stabilizing arrangement. Integrated thrusters saw use in combat as early as March 2555. Auto-repair and bypass nodes: Any damage that the armor plating suffers can be repaired by built-in, triply-redundant subsystems. These systems are receptive to nanomachines facilitating the repair. Additionally, bypass channels allow certain components to function if routing is compromised by extensive damage. Both these systems can fail, resulting in "scarred" armor plating. All non-essential Spartan-IV NPCs in Halo 4 wear the full Recruit armor set and visor color. Steel serves as their suits' primary color and gold is the secondary color. Jared Miller also wears this configuration in Spartan Ops. Concept art of the Mjolnir [GEN2] skinsuit for male wearers. Concept art of the female [GEN2] skinsuit. Armoring process for boots and gauntlets (Click to animate). Shoulders and helmet (Click to animate). The HUD of the [GEN2] armor. A slightly different HUD. Armor bays and technicians can be seen. Fireteam Majestic wearing [GEN2] skinsuits. Spartan-IVs in their armor bay. Fireteam Majestic in their [GEN2] armor. Shields flaring on two [GEN2] suits during the Requiem Campaign. Two Soldier-clad Spartan-IVs engaged in an War Games match on Adrift. All the [GEN2] armor in Halo 4 at launch. A red Air Assault-clad Spartan-IV attacking a blue Recruit-clad Spartan-IV with a ground pound during a War Games match on Regret. Integrated thrusters briefly levitating the user. Note the jets emanating downward from thrusters both in the back and the front. Spartan-IVs utilizing several variants in preparation for War Games. A multitude of customized GEN2 suits. Renders of GEN2 suits in Halo 5: Guardians. ↑ To avoid unnecessary clutter caused by redundant citations, all subsequent entries are cited using the Halo 4 and Halo 5: Guardians Spartan Armor menus.